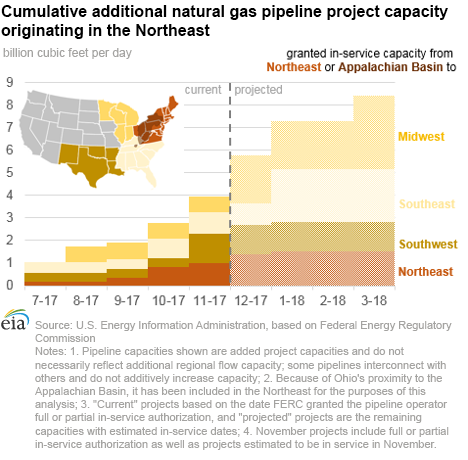 Several natural gas pipeline projects in the Northeast United States are expected to be completed over this coming winter, with more than half of the capacity designed to transport natural gas from the Northeastern Appalachian production region to Midwest and Southeast markets. Between December 2017 and March 2018, 2.6 billion cubic feet per day (Bcf/d) and 1.4 Bcf/d of additional capacity is expected to be in service from the Northeast to the Midwest and from the Northeast to the Southeast, respectively. The pipeline projects out of the Northeast vary in size (from 0.02 Bcf/d to 1.4 Bcf/d) and purpose. 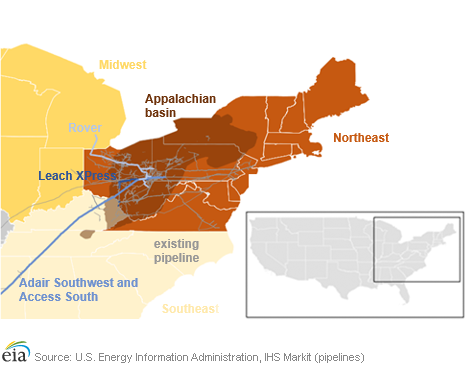 Some projects will serve as short interconnects, while others are designed to deliver natural gas from the Appalachian producing region—where growth in regional production has far outpaced growth in regional consumption—to other markets. Although added project capacities do not necessarily measure the increased deliverability of natural gas, they do give an indication of relative investment and purpose for natural gas pipeline projects (see Note 1 in the figure, above). Among the larger projects is the Rover pipeline project—3.25 Bcf/d—which will move natural gas from the Northeast’s Appalachian supply basin to the Midwest and other markets. The Rover pipeline project is being completed in three phases; Phase 1A (0.7 Bcf/d) was granted in-service authorization in August 2017; Phase 1B (1.4 Bcf/d) is expected to be in service in December 2017; and after delays, Phase 2 (1.15 Bcf/d) is now expected to be in service in March 2018. According to S&P Global Platts, 2.95 Bcf/d of the Appalachian-producer-backed project is subscribed by binding commitments. The Leach XPress is the largest project (1.5 Bcf/d) to bring natural gas from the Appalachian production region to the Southeast. It was originally due to be in service in Fall 2017 but is now expected to enter service in January 2018. Similar to the Rover pipeline, it is primarily backed by regional natural gas producers, according to S&P Global Platts. Pipeline project developers traditionally target early November for project completion to meet increased winter demand. However, some projects targeting an in-service date prior to the start of winter 2017–18 have experienced delays. As of November 2017, about 4 Bcf/d of the 8 Bcf/d planned capacity originating in the Northeast has been added, with 700 MMcf/d going to the Midwest and about 970 MMcf/d going to the Southeast. The balance of the 8 Bcf/d is expected to be in service by the end of March. 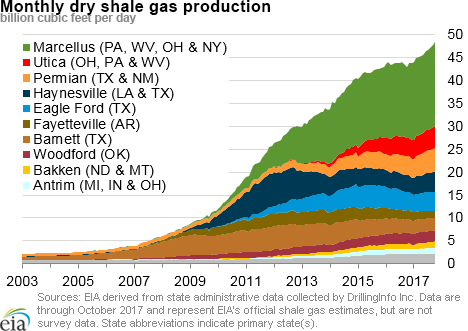 EIA’s November Drilling Productivity Report estimates November-to-December production to increase in the Appalachian region—where more than 40% of onshore U.S. natural gas production now occurs—by 394 million cubic feet per day (MMcf/d) or more than double the increase in any other production region. This increase follows a similar October-to-November increase of 398 MMcf/d. Natural gas spot prices fell at most locations this report week (Wednesday, November 8 to Wednesday, November 15). The Henry Hub spot price fell from $3.15 per million British thermal units (MMBtu) last Wednesday to $3.11/MMBtu yesterday. At the New York Mercantile Exchange (Nymex), the December 2017 contract price fell 9¢ from $3.175/MMBtu last Wednesday to $3.080/MMBtu yesterday. Net withdrawals from working gas totaled 18 billion cubic feet (Bcf) for the week ending November 10. Working natural gas stocks are 3,772 Bcf, which is 7% less than the year-ago level and 3% lower than the five-year (2012–16) average for this week. 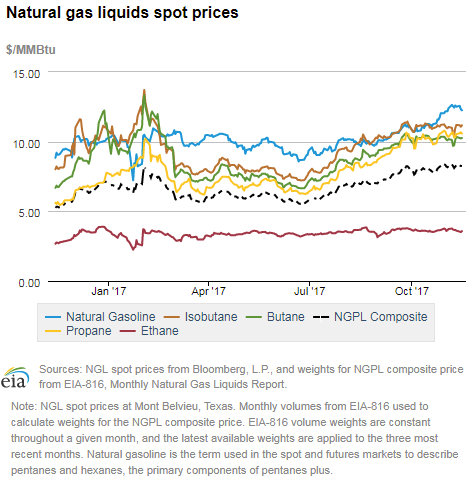 The natural gas plant liquids composite price at Mont Belvieu, Texas, rose by 3¢, averaging $8.26/MMBtu for the week ending November 15. The price of ethane fell by 3%. The price of propane, butane, and isobutane rose by 1%, 3%, and 3%, respectively. The price of natural gasoline remained flat week over week. According to Baker Hughes, for the week ending Friday, November 10, the natural gas rig count remained flat at 169. The number of oil-directed rigs rose by 9 to 738. The total rig count increased by 9, and it now stands at 907. Prices fall at most locations. This report week (Wednesday, November 8 to Wednesday, November 15), the Henry Hub spot price fell 4¢ from $3.15/MMBtu last Wednesday to $3.11/MMBtu yesterday. Henry Hub prices remained within a 10¢ range throughout the week. At the Chicago Citygate, prices decreased 21¢ from $3.31/MMBtu last Wednesday to $3.10/MMBtu yesterday. Northeastern prices down but volatile early in the week because of cold weather forecasts. At the Algonquin Citygate, which serves Boston-area consumers, prices went down 8¢ from $3.47/MMBtu last Wednesday to $3.39/MMBtu yesterday, although the price was volatile throughout the week because of a cold snap forecasted for November 10–11. On November 9, the price jumped $4.72 to $8.19/MMBtu, then dropped to $5.59/MMBtu the next day and continued to decline throughout the report week. Most price points in the region experienced this trend. At the Transcontinental Pipeline Zone 6 trading point for New York, prices decreased 8¢ from $3.19/MMBtu last Wednesday to $3.11/MMBtu yesterday; prices jumped $2.48 on November 9 to $5.67/MMBtu and fell to $3.43/MMBtu the following day before declining throughout the rest of the week. Tennessee Zone 4 Marcellus spot prices increased 25¢ from $2.23/MMBtu last Wednesday to $2.48/MMBtu yesterday. Prices at Dominion South in northwest Pennsylvania fell 4¢ from $2.58/MMBtu last Wednesday to $2.54/MMBtu yesterday. California prices fall as temperatures moderate. Temperatures cooled in California over the week. Prices at PG&E Citygate in Northern California fell 12¢, down from $3.29/MMBtu last Wednesday to $3.17/MMBtu yesterday. The price at SoCal Citygate decreased 17¢ from $4.41/MMBtu last Wednesday to $4.24/MMBtu yesterday. Southern California continues to face pipeline and storage constraints. Supply is up. According to data from PointLogic Energy, the average total supply of natural gas rose by 1% compared with the previous week. Dry natural gas production grew by 1% compared with the previous report week. Average net imports from Canada increased by 14% from last week. Overall demand increases largely because of increased residential consumption and colder temperatures. 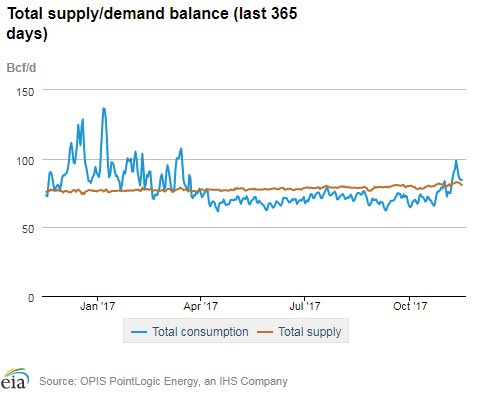 Total U.S. consumption of natural gas rose by 14% compared with the previous report week, according to data from PointLogic Energy. In the residential and commercial sectors, consumption increased by 41% with colder-than-normal temperatures. Natural gas consumed for power generation declined by 1% week over week, and industrial sector consumption increased by 4% week over week. 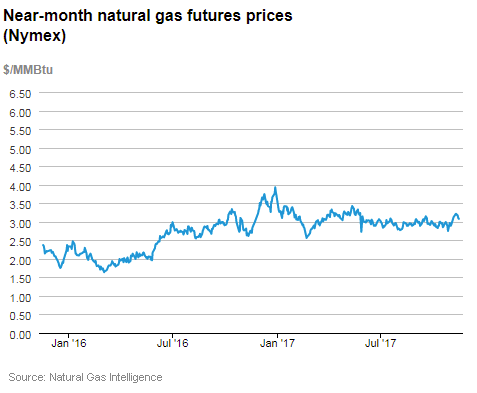 Natural gas exports to Mexico increased 2%, but Genscape reports that because of maintenance on Mexico’s national natural gas grid, exports could be down in the coming report week. U.S. LNG exports increase week over week. Six liquefied natural gas (LNG) vessels (LNG-carrying capacity 21.6 billion cubic feet (Bcf)) departed Sabine Pass liquefaction facility last week (Thursday to Wednesday) and one tanker (LNG-carrying capacity 3.8 Bcf) was loading at the terminal on Wednesday. First net withdrawals of the 2017–18 heating season reported for Lower 48 states. Net withdrawals from storage totaled 18 Bcf, compared with the five-year (2012–16) average net injection of 12 Bcf and last year's net injections of 34 Bcf during the same week. Increased consumption—primarily in the residential/commercial and electric power sectors—resulted in the withdrawals from storage, as colder temperatures moved deeper into the Lower 48 states. Working gas stocks total 3,772 Bcf, which is 101 Bcf less than the five-year average and 271 Bcf less than last year at this time. This deficit is the largest to the five-year average since it totaled 102 Bcf for the report week ending April 17, 2015. During this report week, most of the deficit to the five-year average occurred in the South Central and Pacific regions, where working gas stocks fell to 50 Bcf and 49 Bcf below the five-year average level, respectively. Working gas levels in the East and Midwest regions—where natural gas is an important fuel for space and water heating—were 10 Bcf below and 8 Bcf above the five-year average, respectively. Net injections remain below the five-year average in most regions. The East region reported its second consecutive withdrawal, pulling 9 Bcf of natural gas from storage. The Midwest region posted its first net withdrawals of the heating season, totaling 4 Bcf, or 7 Bcf below the five-year average net change. Net withdrawals in the Mountain region totaled 4 Bcf—5 Bcf below the five-year average net increase for the week. The South Central region posted 2 Bcf of net injections on the week, falling 8 Bcf below the five-year average change of 10 Bcf for the report week. Salt dome facilities posted net injections totaling 5 Bcf, matching its five-year average. The January 2018 futures price trades at a discount compared with the current spot price. 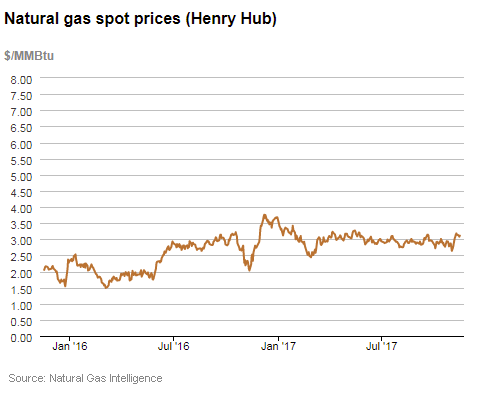 During the most recent storage week, the average natural gas spot price at the Henry Hub was $3.04/MMBtu, while the Nymex futures price of natural gas for delivery in January 2018 averaged $3.23/MMBtu, a difference of 19¢. In contrast, last year, the January contract traded at a premium of 62¢, with spot prices averaging $2.29/MMBtu for the storage week as significant heating load was not a factor last year at this time. Residential/commercial consumption totaled 124 Bcf during the week ending November 11, 2017, compared with 165 Bcf during the most recent storage week, according to PointLogic Energy. 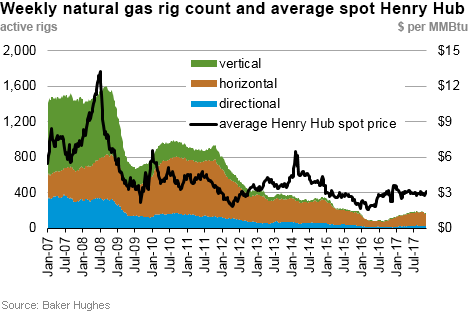 During the most recent storage week, the average natural gas spot price at the Henry Hub was 9¢ lower than the December futures price at the Nymex. A year ago, the spot price was 46¢ lower than the front-month contract. Futures prices trading below the spot price indicate that current market conditions support continued withdrawals of natural gas from storage. The reported net implied flows into storage are close to analysts’ expectations. According to the Desk survey of natural gas analysts, estimates of net withdrawals from working natural gas storage ranged from 4 Bcf to 23 Bcf with a median of 14 Bcf. Prices for the futures contract for December delivery rose about 1¢/MMBtu to $3.10/MMBtu with 390 contracts traded at the release of the Weekly Natural Gas Storage Report (WNGSR). Prices remained close to that level in subsequent trading. Temperatures decline on the week in large portions of the Lower 48 states. Temperatures in the Lower 48 states averaged 51 degrees Fahrenheit (°F), 2°F higher than the normal and 6°F lower than last year at this time. Temperatures were higher than normal in most regions of the Lower 48 states. The principal exception to this pattern occurred in the West North Central Census division, where temperatures averaged 37°F, 5°F lower than the normal and 18°F lower than last year at this time.